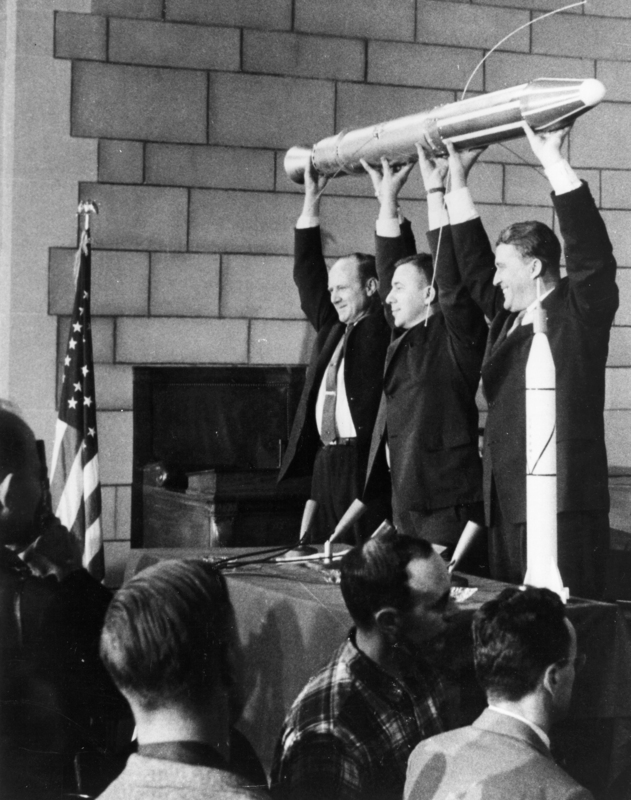 January 31  marked the sixtieth anniversary of the launch of Explorer 1, the first American spacecraft to orbit the Earth. I was five years old; it affected my dreams and aspirations, not to mention my education in science, over the next twenty years. As the story goes, the American rocket and satellite was thrown together in 90 days to answer the launch of Russia’s Sputnik satellite the previous October… and the disaster of our Vanguard rocket, which had blown up on the launch pad. It most notable achievement was the discovery of the Van Allen Belts. Twenty years later, Dr. James Van Allen spoke at my graduate class in space sciences. I recall him describing how he chose to put a Geiger counter into the Explorer satellite because it was cheap, off the shelf, and provided data that was easy to radio back to Earth. They hoped to detect ionized gas when the Explorer’s orbit dipped down into the upper atmosphere. Instead, at the high point of its orbit the geiger counter went wild. Years later I heard a Russian scientist claim that the second Sputnik satellite (the one with the Laika the dog) also had a Geiger counter, and it should have found the belts first. But he said it malfunctioned before launch and they dared not delay the launch to fix it because Khrushchev wanted to brag about Sputnik 2 during the 40th anniversary celebrations of the October Revolution. I can’t confirm the first story; I heard it more than 40 years ago, and Dr. Van Allen died in 2006. The second story, alas, has its problems. Wikipedia tells me that Sputnik 2 was indeed launched to celebrate the October Revolution, and it did indeed carry a Geiger counter. But apparently the Geiger counter worked fine; the problem was that it encountered the radiation belts only when the satellite was on the other side of the Earth from Russia, out of range of their radio receivers. Do I really remember Explorer 1? Or do I only remember saying I remembered it? Our history of events that occurred within our memories often involves remembering not the events themselves but the stories we tell about those events. We have our own memories. We also recall on the memories of others who were also there, on our memories of the stories they tell; and we rely on what was written of those stories, perhaps much later than the events. It’s no surprise that details may vary from one Gospel to another. But the essential points do survive (the Russians had a geiger counter and could have found Van Allen’s belts first) even as the details of the circumstances drift from telling to telling. One story I will swear to, however. After Van Allen’s talk, my fellow grad student Cliff Stoll asked Van Allen for his belt: the one holding up his trousers. For many years, it could be found in the library of Lunar Lab at the University of Arizona, strapped around a big Earth globe. Circa 1975... about the time Van Allen visited. 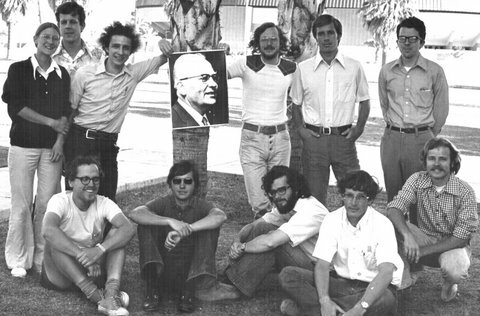 The photo is of Gerard Kuiper, whoa died in 1973; the guy holding it up is Cliff Stoll, who got Van Allen's belt. Can you spot me? I remember those days just fine; what I don't remember is turning old and gray. Hah! It seems that you and I are almost the same age. I was also just 5 years old when Explorer 1 went into orbit. In fact, it is the very first “news” memory I have. (I have no memory of Sputnik 1.) I can still recall the headline and front page of The Arizona Republic with the story and a picture of the launch. A few days later, my whole family stepped out into the back yard to watch the satellite pass overhead (the newspaper had told us exactly when and where to look). In a way, space remained part of my life ever after. My father worked for Motorola, and helped to build the Saturn 5 rocket that took the Apollo 11 astronauts to the Moon. And later on, working for the Department of the Air Force, I supervised the operation of an entire constellation of communications satellites (something unimaginable when Explorer 1 went up). Now retired, as an amateur astronomer I see satellites all the time, sometimes as many as 10 in a single evening. And I sometimes think back to that night in 1958, watching that tiny dot silently orbiting above.